Pouchitis and Ileal Pouch Disorders: A Multidisciplinary Approach for Diagnosis and Management provides much needed information on the evolution of pouch surgery, pouch surgery techniques, and surgery-associated complications, including inflammatory, functional, neoplastic, and metabolic complications. 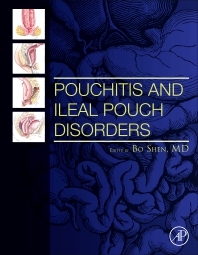 The book provides information on the anatomy of the pouch, pathogenesis of pouchitis and other pouch disorders, proper diagnostic modalities, and medical, endoscopic and surgical options for those disorders. The information has been compiled from a panel of national and international leading experts in the field, including basic scientists, gastrointestinal (GI) pathologists, GI radiologists, gastroenterologists, and more. Prof. Shen is the Ed and Joey Story Endowed Chair, Professor of Medicine of Lerner College of Medicine of Case Western Reserve University, Section Head of IBD and Director of IBD Fellowship at Department of Gastroenterology/Hepatology/Nutrition, the Cleveland Clinic Foundation, Cleveland, Ohio. Prof. Shen is specialized in medical and endoscopic management of inflammatory bowel disease (IBD), colorectal surgery-associated complications, and ileal pouch disorders. He established the subspecialty Pouchitis Clinic in 2002 and the Interventional IBD (i-IBD) Unit in 2009 at Cleveland Clinic, the first and the largest of its kind in the world. Prof. Shen has conducted numerous clinical and translational research projects in IBD, endoscopy, and pouch disorders. Dr. Shen’s research has been funded by the National Institutes of Health (NIH), the American College of Gastroenterology (ACG), Broad Foundation, Crohn’s and Colitis Foundation (CCF), American Society of Colorectal Surgeons, American Gastroenterological Association (AGA), Broad Foundation, and philanthropy. He lectures extensively in the US and overseas. He has published more than 430 peer-reviewed articles in high-impact journals, including Science, Nat Immunol, PNAS, Nat Rev Gastroenterol Hepatol, Gastroenterology, Gut, Am J Gastroenterol, and Ann Surg. He is a contributor for UpToDate®. He edited or co-edited 4 textbook/reference books in IBD, pouch disorders and interventional IBD. He has been visiting professor/guest professor in more than 60 leading academic institutions in the US and abroad. He is also a grant reviewer for the NIH and professional societies. Prof. Shen serves in editorial boards in a dozen of professional journals and has also served in advisory board for the Food and Drug Administration (FDA). Prof. Shen holds Fellowships in ACG, AGA, and ASGE (American Society for Gastrointestinal Endoscopy). Prof. Shen has won multiple institutional and national awards. He has been the research mentor for more than 100 medical students, medical and surgical residents/fellows, junior faculty, and oversea scholars.